Let's get shapely. 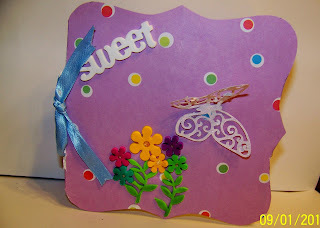 Join us at Just A Scrappin' weekly Challenge to make a card that is not a square or a rectangle . You can use any theme or colors. I used Cricut Cartridge Art Philosophy Card <squar4> at 5 1/2" on pattern and <bttrfly2> layer on glitter cardstock. Using the cut made by Card I put in the blue ribbon. By adding "Sweet" I can use this for Cards for Hospitalized Kids"
Love your card! Those bright flowers and butterfly are so pretty! Thanks so much for stopping by my blog the other day!